Low fertility levels have become a typical characteristic of industrialised countries where two distinct patterns are observed. A number of countries, especially in southern Europe and East Asia, have persistently low fertility levels. Another group of countries, such as Sweden and Finland, after a period of fluctuation, have managed to achieve fertility close to replacement levels (Goldscheider, Bernhardt, & Lappegard, 2015). Very low fertility, in the absence of a large number of immigrants, will affect the future labour supply and may lead to a host of associated social problems, notably threatening the sustainability of pay-as-you-go welfare systems, as currently organized. In recent years, gender roles and relations have been identified as central factors behind these divergent trajectories; in European countries, increases in fertility rates have been linked to larger contributions to domestic work by fathers. Raymo et al (2015) suggest that a similar mechanism is at work in East Asia. They argue that the reason for the persistently low fertility trends in East Asian countries may be the tension between the rapidly growing educational and employment opportunities for women and the limited change in the gendered expectations of the roles men and women play within families. In a recent paper (Kan and Hertog, 2017) we evaluated this proposition by looking at the association between gender balance in domestic work and fertility in four countries known for low fertility, high gender inequality both in the labour market and in the domestic sphere, and a dearth of policies to address this issue. Not only is routine housework primarily “women’s work” in all the four countries, but having children increases the amount of routine housework for women but not for men, meaning that it is mostly women who have to balance the increased demands on their time if they have (more) children. While in low-fertility European countries husbands’ education has been associated with greater involvement in domestic work (Sullivan, Billari, & Altintas, 2014), this does not seem to be the case in East Asia. 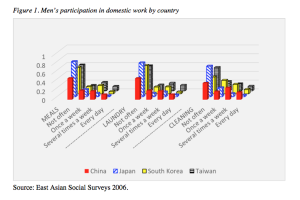 Wives’ better education is the largest factor contributing to greater equality in the domestic division of labour in Japan, China, and Taiwan, but not in Korea. The somewhat greater equality in contributions to domestic work among better educated couples in the three countries is hence largely the result of the wives’ lower contributions, rather than of husbands’ higher ones. 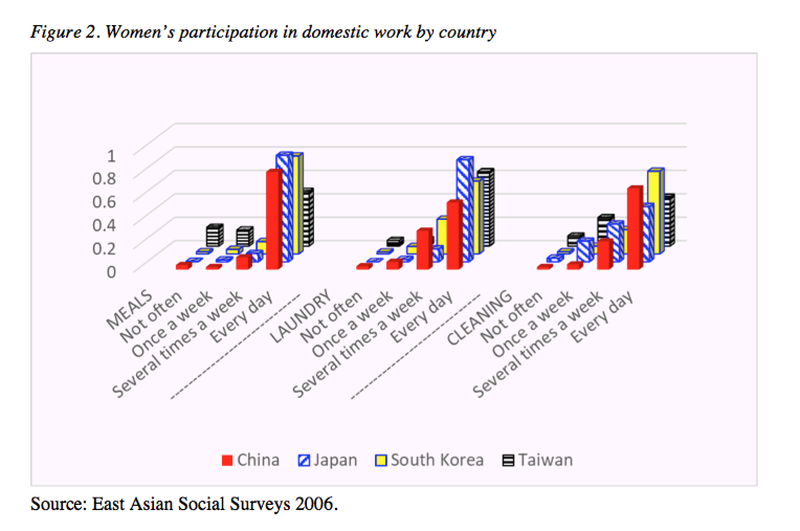 We go on to analyse the associations between male housework participation and the number of children married men and women aspire to in China, Japan, South Korea, and Taiwan. For men, we find no consistent pattern across the four countries linking household participation and fertility preferences. This is hardly surprising, given that the number of children does not seem to have any effect on the amount of domestic work these men engage in. The pattern for women, by contrast, reflects the difficulties they face in balancing their work and family lives: they prefer to have fewer children if their housework share increases. Indeed, couples who share housework equally are 11% more likely to desire an additional child compared to couples where the husband seldom participates in housework. This is particularly notable given the limited variation in the preferred number of children that is a consequence of a widely shared norm prescribing two children as an ideal number. 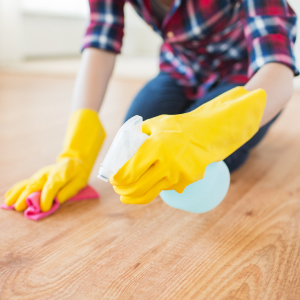 In sum, the large inequality in domestic work contributions in the four countries analysed is likely to play an important role in discouraging women from having more children. In the short term, this suggests a rather bleak outlook for East Asian fertility trends. Until the social and institutional structures enabling men to contribute more to domestic work are in place, and the norms and attitudes evolve towards a greater willingness among men in the four countries to share the responsibilities of domestic work with women, the fertility rates there are likely to remain stubbornly low. These East Asian countries are similar to conservative European countries, such as Italy, Spain, and Germany, which have the lowest fertility in Europe, and where a traditional gender division of domestic labour is associated with a lower fertility preference. This suggests that men need to change their attitudes to domestic work, and societies need to adapt to the new role of women, if we want fertility to move closer to replacement level in all of the developed countries. Goldscheider F., Bernhardt E., Lappegard T. (2015). The Gender Revolution: A Framework for Understanding Changing Family and Demographic Behavior. Population and Development Review, 41(2), 207-239. Kan M.Y., Hertog E. (2017). 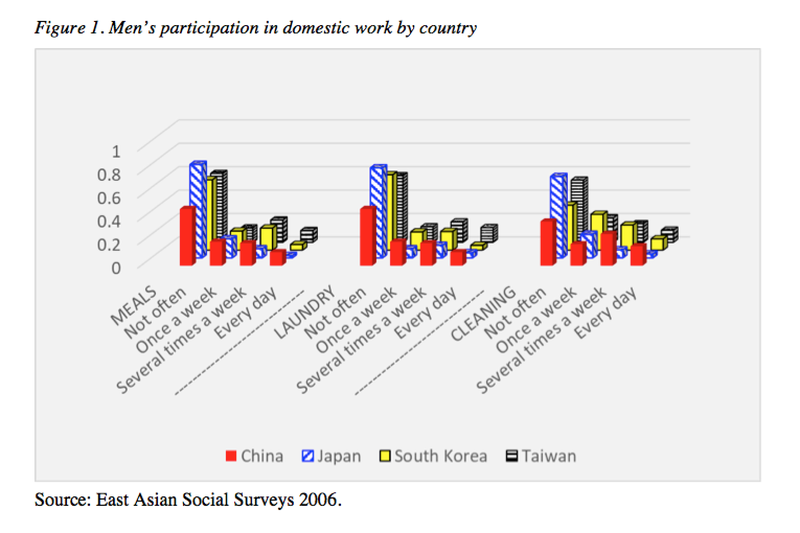 Domestic division of labour and fertility preference in China, Japan, South Korea, and Taiwan. Demographic Research, 36, 557-587. Raymo J.M., Park H., Xie Y., Yeung W.-j.J. (2015). Marriage and Family in East Asia: Continuity and Change. In K. S. Cook & D. S. Massey (Eds. ), Annual Review of Sociology, Vol 41 (Vol. 41, pp. 471-492). Sullivan, O., Billari, F.C., & Altintas, E. (2014). Fathers’ Changing Contributions to Child Care and Domestic Work in Very Low-Fertility Countries: The Effect of Education. Journal of Family Issues (February), 1-18.